In every position you are in in life, there is someone you must lean on, someone you must run to for advice, someone you need. I've found myself in that position many times over the last 6 years since L's diagnosis with Fragile X Syndrome. In that regard, I've been blessed with many friends who have become more like family to me. I know that, no matter what the situation is, I can turn to them for advice, use their knowledge, or just vent to them. One in particular is Mrs. Cindi Rogers. She has been there for me in many of my darkest times, including the time my heater went out and my husband was deployed. She called me all the way from Colorado, handed the phone to Chris, and helped the girls and me stay warm during a south Texas cold front. More importantly, though, Cindi has helped me through many of our Fragile X issues, the latest of which was our potty-training saga. I received some of the best tips from her and am proud to say that, after 6 1/2 years, my daughter finally had success on the toilet. Having been there and done that, fighting her own battles with overcoming FX issues, and continuing to learn through the years, Cindi has done what I have only dreamed of doing. She has put it all down on paper! 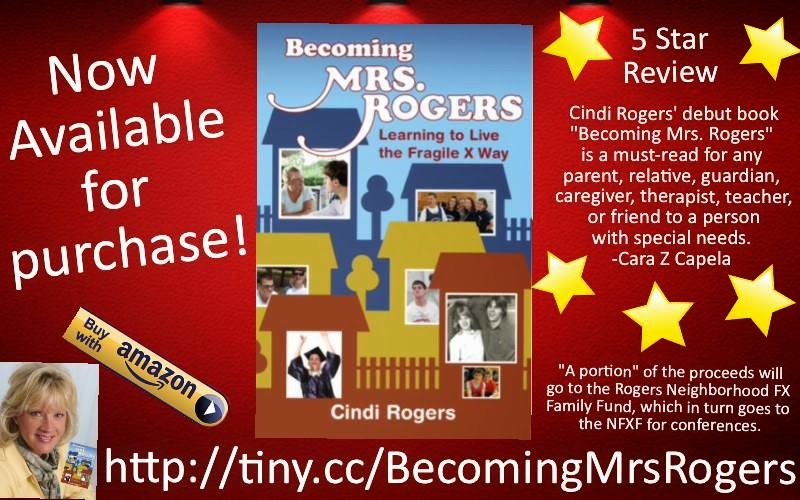 We are so excited to announce that Cindi Rogers first book, Becoming Mrs. Rogers is now available on Amazon.com at the link below. This book was a labor of love for Cindi, as well as her husband, Chris. The process has been a wonderful learning experience and going forward will continue to require more learning. This book is a memoir of sorts about her life (and Chris') in dealing with the birth and subsequent diagnosis of fragile X syndrome for their two boys. The timeline travels from birth to present day and covers a lot of different issues like school, behavior, therapies and day-to-day life. It will take you through some downs and eventually some ups, only to come out with moments of joy and hope. "It was an emotional journey for me while writing it, for Chris while reading it, and we hope for you, too", says Cindi. Becoming Mrs. Rogers is the true and heart-felt story of one couple’s journey into acceptance following a devastating genetic diagnosis for both of their sons. 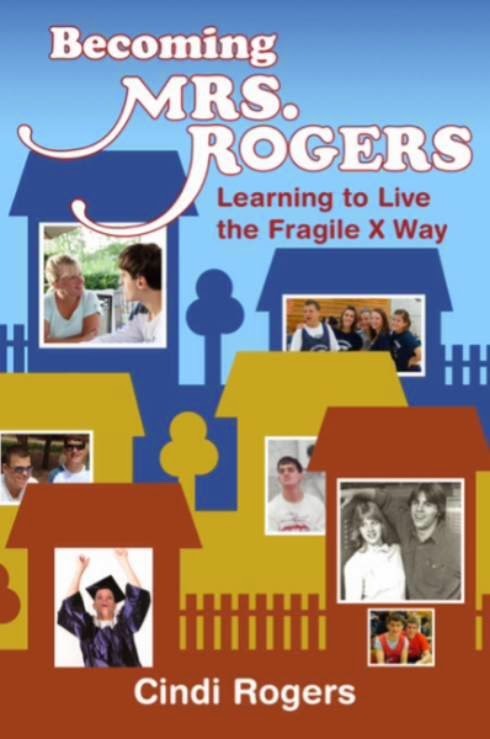 Their story, its highs and lows entwined with its wisdom and compassion, has been a beacon of hope for thousands of families struggling with fragile X and other autism spectrum disorders. Cindi Rogers and her husband, Chris, share their perspectives and tools they embraced in order to help their boys be as happy and independent as they can possibly be. It is a story of challenges, tears, joy and hope. We also hope that you might consider reading it, and/or sharing it (forward this blog if you'd like) with others in your life that might benefit from such a story. Cindi Rogers is the mother of two sons, ages 23 and 25, who are affected with fragile X syndrome and autism. 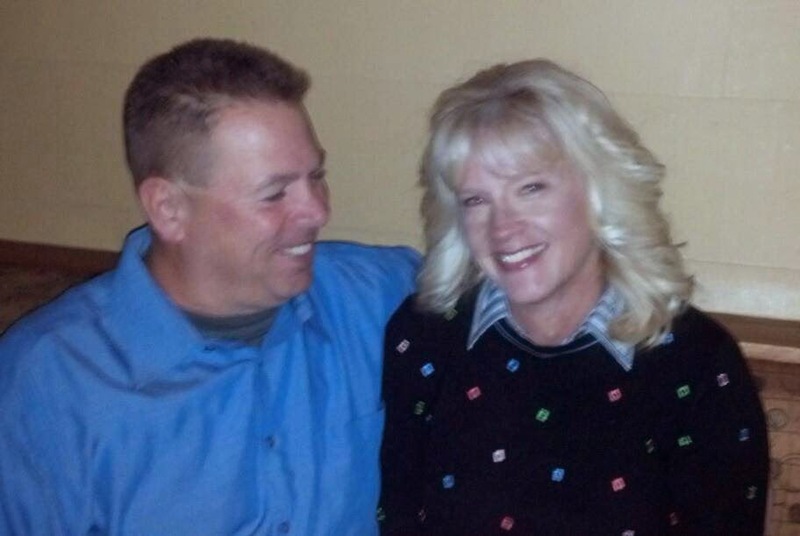 Since receiving this diagnosis, Cindi has become a leader and symbol of hope within the fragile X community. Her positive attitude, creativity and defining can-do attitude has inspired families and professionals worldwide. Cindi and her family have traveled to conferences around the world to present her innovative strategies, helping families not only to live with fragile X, but to also thrive. It has become her personal mission to share techniques to help families generate ideas that they can implement in their own world, while helping their children with fragile X syndrome to live happier, more independent lives. Today, Cindi serves on the board of directors for Developmental FX in Denver, a non-profit that helps families just like hers learn to thrive in the face of fragile X syndrome. She lives and works with her husband and two sons in Littleton, Colorado, and together they love travelling the U.S. in their RV named Rocket.